Buy Licorne AIO - Get 10k Free CAPTCHAs! All-In-One SEO Software Solution. Improve Search Engine Rankings. Increase Website Traffic and Viewership. 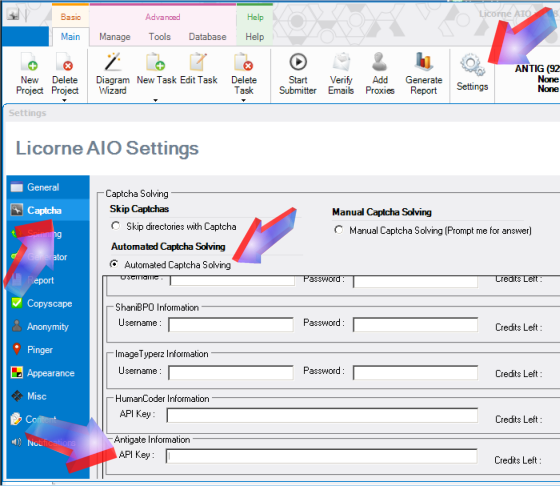 Licorne AIO (All-In-One) is the Ultimate SEO Software from Licorne Solutions. By combining more than 50 highly advanced techniques and features for SEO, Licorne AIO plans to become the best of its kind! Then "File" =>"Save" and "File" => "Close"
Licorne AIO => Settings => Tab "Captcha" => select "Automated Captcha Solving" =>Use "Antigate Information" =>insert your 9kw.eu api key in the field "API Key" =>"Save".